Nowadays mobile devices are highly heterogeneous both in terms of terminal types (e.g., smartphones versus data modems) and usage scenarios (e.g., mobile browsing versus machine-to-machine applications). Additionally, the complexity of mobile terminals is continuously growing due to increases in computational power and advances in mobile operating systems. In this scenario novel traffic patterns may arise in mobile networks, and it is highly desirable for operators to understand their impact on the network performance. We address this problem by characterizing the traffic of different device types and Operating systems, analyzing real traces from a large scale mobile operator. We find the presence of highly time synchronized spikes in both data and signaling plane traffic generated by different types of devices. Additionally, by investigating a real case, we show that a device-specific view on traffic can efficiently support the root cause analysis of some type of network anomalies. 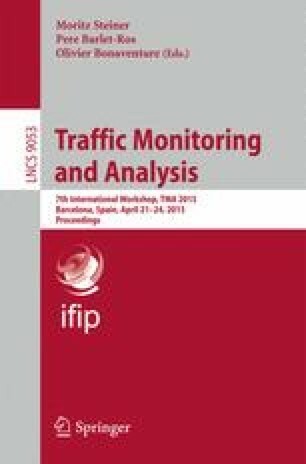 Our analysis confirms that large traffic peaks, potentially leading to large-scale anomalies, can be induced by the misbehavior of a specific device type. Accordingly, we advocate the need for novel analysis methodologies for automatic detection and possibly mitigation of such device-triggered network anomalies.